I've been busy with work and a couple of trips to Portland this month so not much posting. I did want to make sure to get this one in since I came up with it on the fly using available ingredients and wanted to get it down in writing. 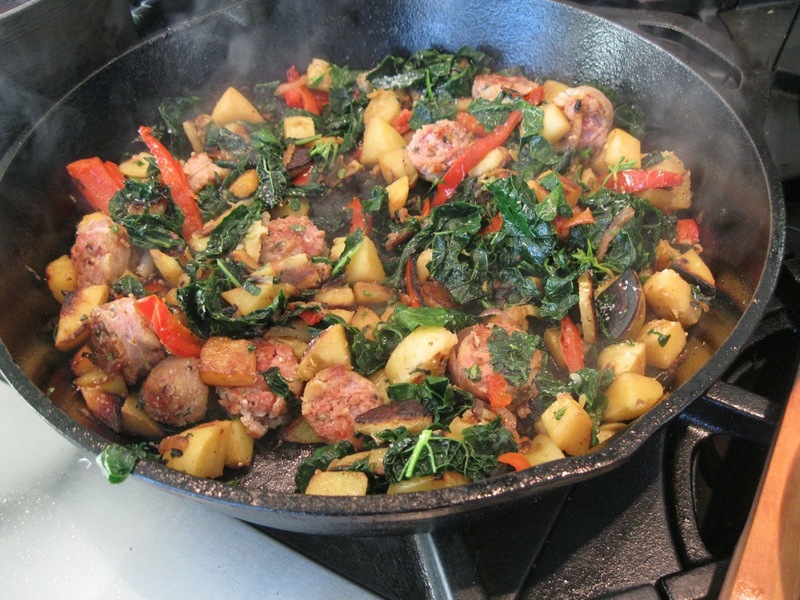 We're harvesting Lacinato kale from the garden now so thought it would be good to combine it with some frozen Toulouse sausage we had saved a while back; potatoes seemed like a good compliment and it was a bit chilly that day so all told seemed like a good pick for a one-dish meal. 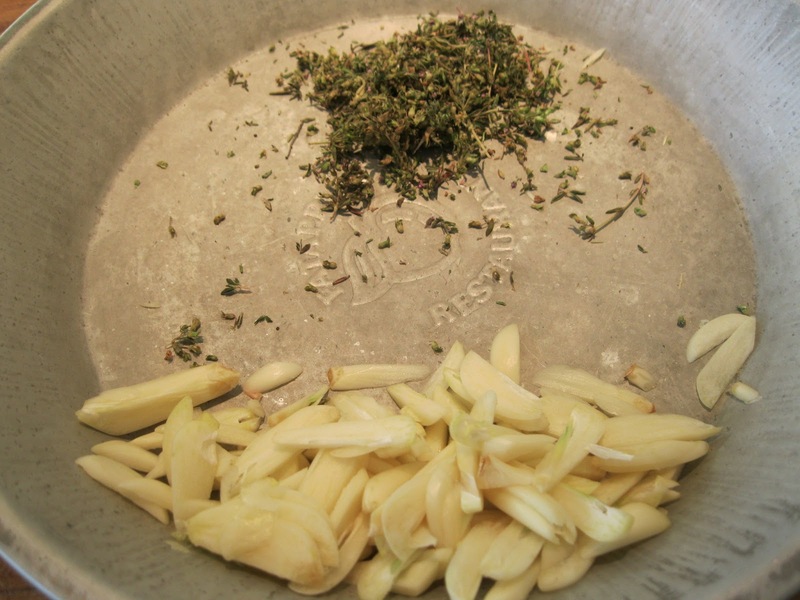 Fill a small saucepan with water and bring to a simmer. Add the sausage to parboil for about 3-4 minutes. Remove from the water and pat dry with paper towels. Slice into 1/2 inch coins. Heat a large skillet over medium heat, when hot add the oil. Add the sliced garlic and heat for a couple of minutes to translucence. 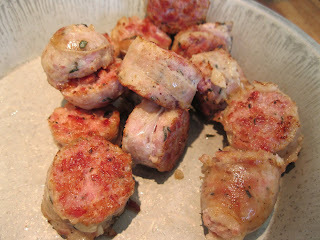 Add the sliced sausage to brown and heat through completely. 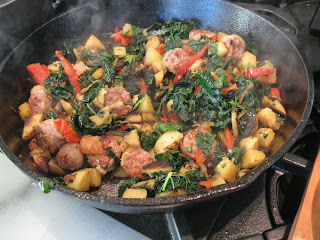 When the sausage is done, remove from heat to set aside keeping the oil in the pan. Fill a large saucepan with water and bring to a boil. 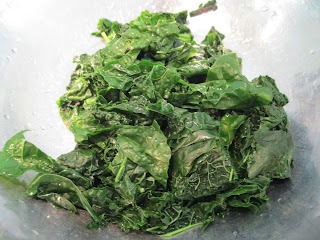 Add the kale leaves to parboil for about 3-4 minutes. 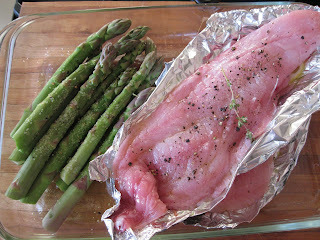 Remove from the pan and set aside to cool. In the skillet, still over the medium heat, cook the onion and pepper to translucence, about 5 minutes. 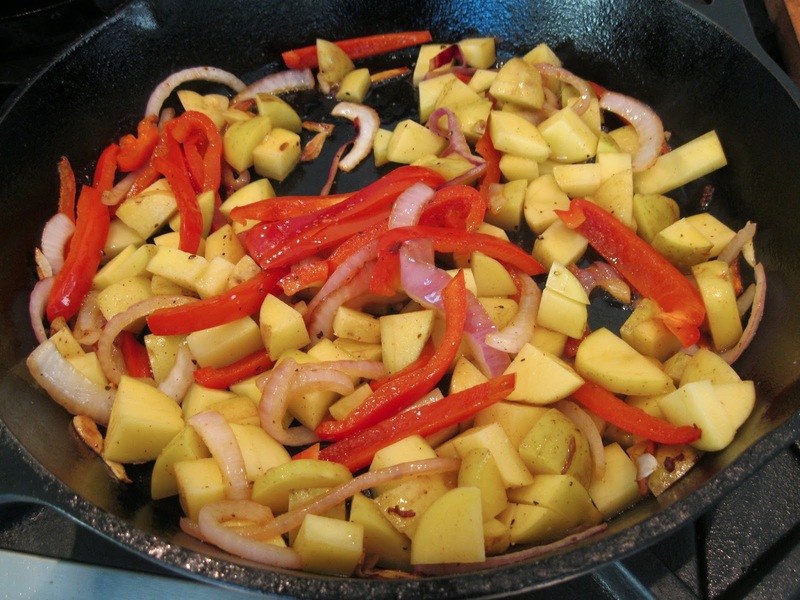 Add the tomato paste then the cubed potatoes, bringing the heat down to a medium-low and covering the skillet to cook until the potato is soft, about 15-20 minutes. Add some water to the pan if it is dry to get a little steam going while the vegetables cook. Chop the kale. When the onion, pepper, potato mix is cooked and soft, uncover the skillet and add the sausage and kale to heat through completely stirring in the chopped oregano leaves. Salt and pepper to taste and serve. 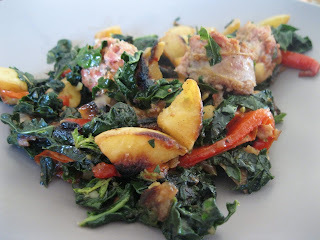 I've been making this dish for years, a great recipe for weeknights as it's easy, simple, and delicious. I originally got it from Patricia Wells' Trattoria, a great little book of simple dishes from the trattorias of Italy. Definitely worth checking out, especially if you'd like to attempt recreating the feel of meals from a trip there. I've added the bit about adding the cooked spaghetti into the pan at the end as the pasta picks up a lot of the flavor of the shrimp and seasonings. 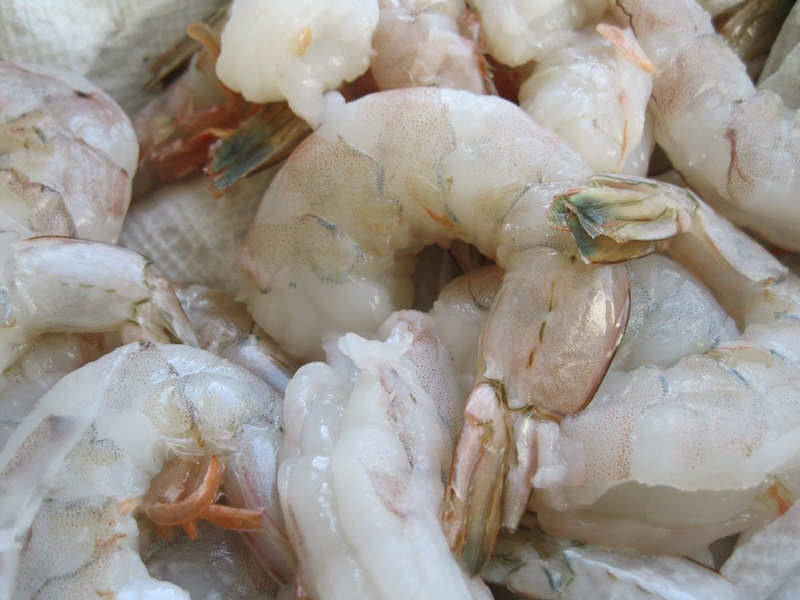 Rinse the prawns, pat dry, and set aside. Heat a large pot of water to boiling. Add the spaghetti and cook until one minute short of the recommended cooking time on the package. At some point while the pasta is cooking, ladle out about 1/2 cup of the pasta water and set aside. Meanwhile heat the oil in a large skillet over medium-high heat then add the the garlic, thyme, pepper flakes, and shrimp. Toss ingredients to coat with the oil and cook until the shrimp starts to color, about 90 seconds. 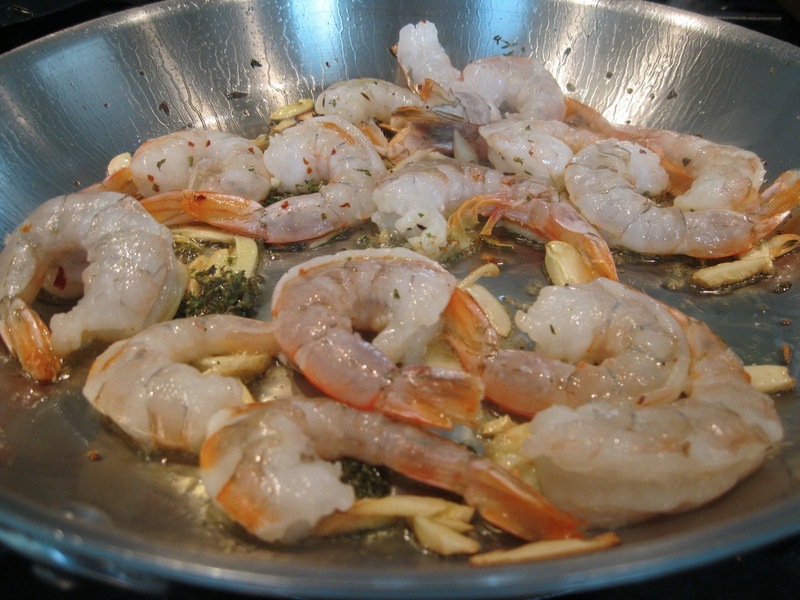 Use tongs to turn each shrimp over and cook for another minute. Be careful not to overcook the shrimp. 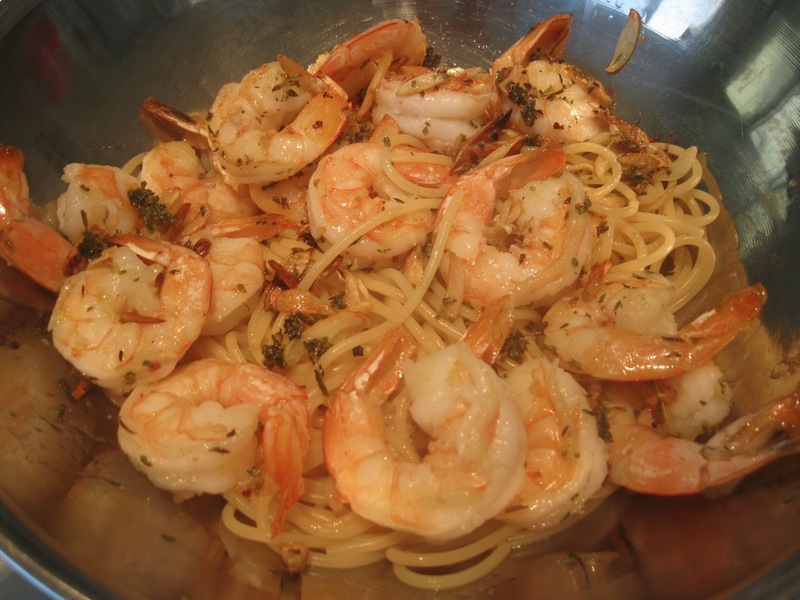 There's a bit of timing involved to have the shrimp just finished when the pasta is ready to drain as you want avoid the shrimp to sit on the heat for too long as well have the pasta ready to drain at about the same time. Drain the pasta then add to the pan with the shrimp. 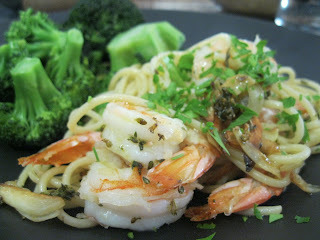 Toss to combine for about a minute, add the chopped parsley and serve immediately, drizzling olive oil on top if desired. I wouldn't add any cheese to this dish. This week's Siren SeaSA drop, black gill rockfish. We got a drop of the same from them last month and this one proved to be just as delicious. However since the Big Green Eggs are out and already pressed into the warm weather service, I just had to grill the fillets this time. 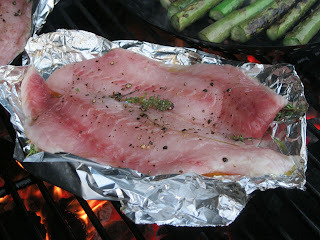 Since there was no skin, I took the same approach that I take with most fillets I grill: cooking them on a foil platter with fresh herbs, lemon slices underneath and seasoned with olive oil, salt, and pepper, cooking them until the color changes and the meat starts to flake easily. Very reliable, nothing sticks to the grill, and the flavor is enhanced with the smokiness of the wood, in this case, apple. Fashion a small plate from tin foil just larger than the dimensions of the fillet. 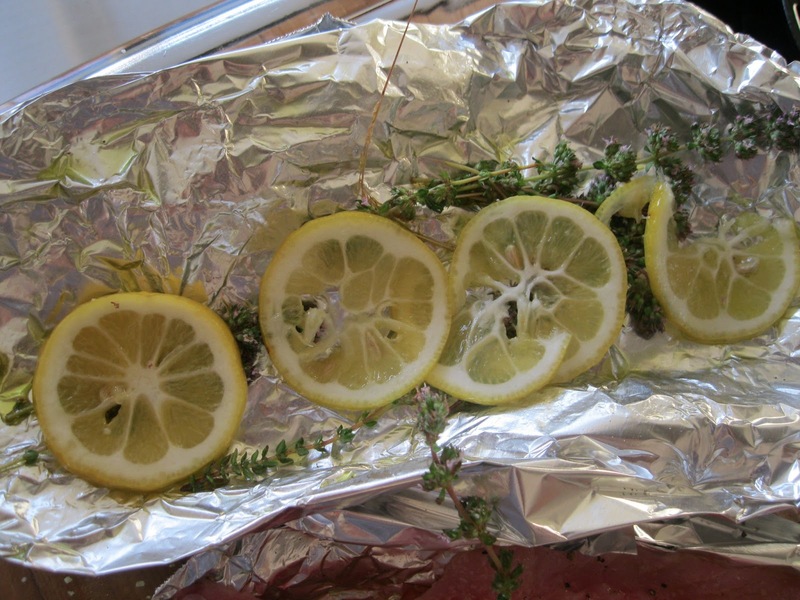 Drizzle some of the oil on the foil then lay out the lemon slices and thyme twigs as a bed for the fillet. Place the fillet on the herbs drizzling some more oil along with the salt and pepper. On a prepared grill, lay the foil on the grate and cover the grill, cooking until the fillet has changed color and starts to flake; there's no need to turn the fish at all while it cooks. For a light fish like this I find it takes about 6-7 minutes though your mileage may vary. Try not to overcook but make sure not to undercook. 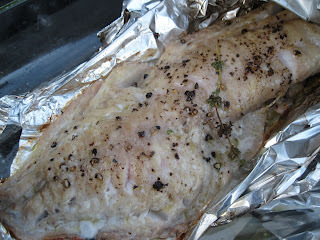 Obvious flaking will almost always guarantee that the fish is done. 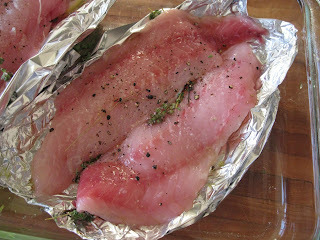 Remove from the grill, lift off of the foil and serve.